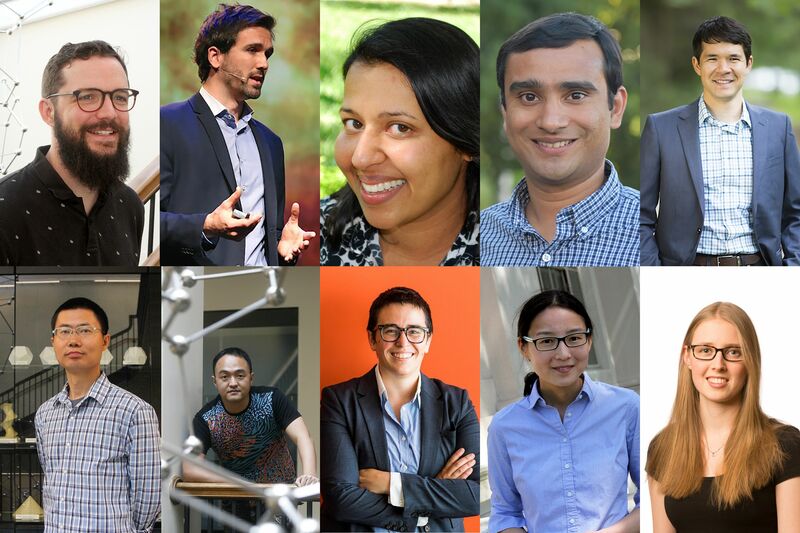 The MIT School of Science recently welcomed 10 new professors in the departments of Biology Brain and Cognitive Sciences, Chemistry, Physics, Mathematics, and Earth, Atmospheric and Planetary Sciences. Tristan Collins conducts research at the intersection of geometric analysis, partial differential equations, and algebraic geometry. In joint work with Valentino Tosatti, Collins described the singularity formation of the Ricci flow on Kahler manifolds in terms of algebraic data. In recent work with Gabor Szekelyhidi, he gave a necessary and sufficient algebraic condition for existence of Ricci-flat metrics, which play an important role in string theory and mathematical physics. This result lead to the discovery of infinitely many new Einstein metrics on the 5-dimensional sphere. With Shing-Tung Yau and Adam Jacob, Collins is currently studying the relationship between categorical stability conditions and existence of solutions to differential equations arising from mirror symmetry. Collins earned his BS in mathematics at the University of British Columbia in 2009, after which he completed his PhD in mathematics at Columbia University in 2014 under the direction of Duong H. Phong. Following a four-year appointment as a Benjamin Peirce Assistant Professor at Harvard University, Collins joins MIT as an assistant professor in the Department of Mathematics. Julien de Wit develops and applies new techniques to study exoplanets, their atmospheres, and their interactions with their stars. While a graduate student in the Sara Seager group at MIT, he developed innovative analysis techniques to map exoplanet atmospheres, studied the radiative and tidal planet-star interactions in eccentric planetary systems, and constrained the atmospheric properties and mass of exoplanets solely from transmission spectroscopy. He plays a critical role in the TRAPPIST/SPECULOOS project, headed by Université of Liège, leading the atmospheric characterization of the newly discovered TRAPPIST-1 planets, for which he has already obtained significant results with the Hubble Space Telescope. De Wit’s efforts are now also focused on expanding the SPECULOOS network of telescopes in the northern hemisphere to continue the search for new potentially habitable TRAPPIST-1-like systems. De Wit earned a BEng in physics and mechanics from the Université de Liège in Belgium in 2008, an MS in aeronautic engineering and an MRes in astrophysics, planetology, and space sciences from the Institut Supérieur de l’Aéronautique et de l’Espace at the Université de Toulouse, France in 2010; he returned to the Université de Liège for an MS in aerospace engineering, completed in 2011. After finishing his PhD in planetary sciences in 2014 and a postdoc at MIT, both under the direction of Sara Seager, he joins the MIT faculty in the Department of Earth, Atmospheric and Planetary Sciences as an assistant professor. Ila Fiete uses computational and theoretical tools to better understand the dynamical mechanisms and coding strategies that underlie computation in the brain, with a focus on elucidating how plasticity and development shape networks to perform computation and why information is encoded the way that it is. Her recent focus is on error control in neural codes, rules for synaptic plasticity that enable neural circuit organization, and questions at the nexus of information and dynamics in neural systems, such as understand how coding and statistics fundamentally constrain dynamics and vice-versa. After earning a BS in mathematics and physics at the University of Michigan, Fiete obtained her PhD in 2004 at Harvard University in the Department of Physics. While holding an appointment at the Kavli Institute for Theoretical Physics at the University of California, Santa Barbara from 2004 to 2006, she was also a visiting member of the Center for Theoretical Biophysics at the University of California at San Diego. Fiete subsequently spent two years at Caltech as a Broad Fellow in brain circuitry, and in 2008 joined the faculty of the University of Texas at Austin. She joins the MIT faculty in the Department of Brain and Cognitive Sciences as an associate professor with tenure. Ankur Jain explores the biology of RNA aggregation. Several genetic neuromuscular disorders, such as myotonic dystrophy and amyotrophic lateral sclerosis, are caused by expansions of nucleotide repeats in their cognate disease genes. Such repeats cause the transcribed RNA to form pathogenic clumps or aggregates. Jain uses a variety of biophysical approaches to understand how the RNA aggregates form, and how they can be disrupted to restore normal cell function. Jain will also study the role of RNA-DNA interactions in chromatin organization, investigating whether the RNA transcribed from telomeres (the protective repetitive sequences that cap the ends of chromosomes) undergoes the phase separation that characterizes repeat expansion diseases. Jain completed a bachelor’s of technology degree in biotechnology and biochemical engineering at the Indian Institute of Technology Kharagpur, India in 2007, followed by a PhD in biophysics and computational biology at the University of Illinois at Urbana-Champaign under the direction of Taekjip Ha in 2013. After a postdoc at the University of California at San Francisco, he joins the MIT faculty in the Department of Biology as an assistant professor with an appointment as a member of the Whitehead Institute for Biomedical Research. Kiyoshi Masui works to understand fundamental physics and the evolution of the universe through observations of the large-scale structure — the distribution of matter on scales much larger than galaxies. He works principally with radio-wavelength surveys to develop new observational methods such as hydrogen intensity mapping and fast radio bursts. Masui has shown that such observations will ultimately permit precise measurements of properties of the early and late universe and enable sensitive searches for primordial gravitational waves. To this end, he is working with a new generation of rapid-survey digital radio telescopes that have no moving parts and rely on signal processing software running on large computer clusters to focus and steer, including work on the Canadian Hydrogen Intensity Mapping Experiment (CHIME). Masui obtained a BSCE in engineering physics at Queen’s University, Canada in 2008 and a PhD in physics at the University of Toronto in 2013 under the direction of Ue-Li Pen. After postdoctoral appointments at the University of British Columbia as the Canadian Institute for Advanced Research Global Scholar and the Canadian Institute for Theoretical Astrophysics National Fellow, Masui joins the MIT faculty in the Department of Physics as an assistant professor. Phiala Shanahan studies theoretical nuclear and particle physics, in particular the structure and interactions of hadrons and nuclei from the fundamental (quark and gluon) degrees of freedom encoded in the Standard Model of particle physics. Shanahan’s recent work has focused on the role of gluons, the force carriers of the strong interactions described by quantum chromodynamics (QCD), in hadron and nuclear structure by using analytic tools and high-performance supercomputing. She recently achieved the first calculation of the gluon structure of light nuclei, making predictions that will be testable in new experiments proposed at Jefferson National Accelerator Facility and at the planned Electron-Ion Collider. She has also undertaken extensive studies of the role of strange quarks in the proton and light nuclei that sharpen theory predictions for dark matter cross-sections in direct detection experiments. To overcome computational limitations in QCD calculations for hadrons and in particular for nuclei, Shanahan is pursuing a program to integrate modern machine learning techniques in computational nuclear physics studies. Shanahan obtained her BS in 2012 and her PhD in 2015, both in physics, from the University of Adelaide. She completed postdoctoral work at MIT in 2017, then held a joint position as an assistant professor at the College of William and Mary and senior staff scientist at the Thomas Jefferson National Accelerator Facility until 2018. She returns to MIT in the Department of Physics as an assistant professor. Nike Sun works in probability theory at the interface of statistical physics and computation. Her research focuses in particular on phase transitions in average-case (randomized) formulations of classical computational problems. Her joint work with Jian Ding and Allan Sly establishes the satisfiability threshold of random k-SAT for large k, and relatedly the independence ratio of random regular graphs of large degree. Both are long-standing open problems where heuristic methods of statistical physics yield detailed conjectures, but few rigorous techniques exist. More recently she has been investigating phase transitions of dense graph models. Sun completed BA mathematics and MA statistics degrees at Harvard in 2009, and an MASt in mathematics at Cambridge in 2010. She received her PhD in statistics from Stanford University in 2014 under the supervision of Amir Dembo. She held a Schramm fellowship at Microsoft New England and MIT Mathematics in 2014-2015 and a Simons postdoctoral fellowship at the University of California at Berkeley in 2016, and joined the Berkeley Department of Statistics as an assistant professor in 2016. She returns to the MIT Department of Mathematics as an associate professor with tenure. Alison Wendlandt focuses on the development of selective, catalytic reactions using the tools of organic and organometallic synthesis and physical organic chemistry. Mechanistic study plays a central role in the development of these new transformations. Her projects involve the design of new catalysts and catalytic transformations, identification of important applications for selective catalytic processes, and elucidation of new mechanistic principles to expand powerful existing catalytic reaction manifolds. Wendlandt received a BS in chemistry and biological chemistry from the University of Chicago in 2007, an MS in chemistry from Yale University in 2009, and a PhD in chemistry from the University of Wisconsin at Madison in 2015 under the direction of Shannon S. Stahl. Following an NIH Ruth L. Krichstein Postdoctoral Fellowship at Harvard University, Wendlandt joins the MIT faculty in the Department of Chemistry as an assistant professor. Chengyang Xu specializes in higher-dimensional algebraic geometry, an area that involves classifying algebraic varieties, primarily through the minimal model program (MMP). MMP was introduced by Fields Medalist S. Mori in the early 1980s to make advances in higher dimensional birational geometry. The MMP was further developed by Hacon and McKernan in the mid-2000s, so that the MMP could be applied to other questions. Collaborating with Hacon, Xu expanded the MMP to varieties of certain conditions, such as those of characteristic p, and, with Hacon and McKernan, proved a fundamental conjecture on the MMP, generating a great deal of follow-up activity. In collaboration with Chi Li, Xu proved a conjecture of Gang Tian concerning higher-dimensional Fano varieties, a significant achievement. In a series of papers with different collaborators, he successfully applied MMP to singularities. Xu received his BS in 2002 and MS in 2004 in mathematics from Peking University, and completed his PhD at Princeton University under János Kollár in 2008. He came to MIT as a CLE Moore Instructor in 2008-2011, and was subsequently appointed assistant professor at the University of Utah. He returned to Peking University as a research fellow at the Beijing International Center of Mathematical Research in 2012, and was promoted to professor in 2013. Xu joins the MIT faculty as a full professor in the Department of Mathematics. Zhiwei Yun’s research is at the crossroads between algebraic geometry, number theory, and representation theory. He studies geometric structures aiming at solving problems in representation theory and number theory, especially those in the Langlands program. While he was a CLE Moore Instructor at MIT, he started to develop the theory of rigid automorphic forms, and used it to answer an open question of J-P Serre on motives, which also led to a major result on the inverse Galois problem in number theory. More recently, in his joint work with Wei Zhang, they give geometric interpretation of higher derivatives of automorphic L- functions in terms of intersection numbers, which sheds new light on the geometric analogue of the Birch and Swinnerton-Dyer conjecture. Yun earned his BS at Peking University in 2004, after which he completed his PhD at Princeton University in 2009 under the direction of Robert MacPherson. After appointments at the Institute for Advanced Study and as a CLE Moore Instructor at MIT, he held faculty appointments at Stanford and Yale. He returned to the MIT Department of Mathematics as a full professor in the spring of 2018.